As a kid, I always saw myself as Luke Skywalker, but I always wanted to be Han Solo. As I wrote when The Last Jedi came out, I identified with Luke’s awkwardness and compassion, but envied Han’s charm and natural skill. It wasn’t until later that I began to appreciate the complexities in Han’s character arc. Han Solo isn’t simply a walking bundle of swagger. Over the course of the Original Trilogy, the character overcame his insecurities and learned to trust people. In many ways, Solo: A Star Wars Story, the latest Star Wars film from Disney and Lucasfilm, builds upon this and enriches the character arc. However, in attempting to provide a backstory for Solo, it also removes some of the mystery and possibly smoothens the character’s rougher edges. The Han Solo we see in Solo: A Star Wars Story is a very different Han from the one we saw in the Original Trilogy – and not simply because Alden Ehrenreich replaces Harrison Ford as the titular character. The movie is set approximately 10 years before A New Hope, so we see a much younger Han who is still figuring out his place in the galaxy. In the opening scene, Han escapes from a street gang on his homeworld Corellia and enlists in the Imperial Navy. Several years later, he gets kicked out of the Imperial Academy for disobeying orders and finds himself to serving in the infantry. During a bloody siege on the planet Mimban, he meets Tobias Beckett (Woody Harrelson), a mercenary who enlists him for a train heist (the plot bears an uncanny resemblance to the Firefly episode “The Train Job”). Han also helps break Chewbacca (Joonas Suotamo) out of prison, an act that leads to a lifelong friendship. Solo does an excellent job showing us a Han Solo as a young man. Many of the pre-Disney Expanded Universe books about Han Solo’s younger days tended to depict Han before A New Hope as simply Han with fewer gray hairs. Solo actually shows a character who could plausibly become Han, yet is still lacks the trademark experience and confidence. To be sure, Han still comes as cocky, but at this point in his life Han’s swagger is partly an act. He constantly tries to persuade other characters, but seems to win them over more through his earnestness than actual charm. While he might claim to be the best pilot in the galaxy, he often wins the day through clever improvisation than raw skill. I still can’t quite see Alden Ehrenreich as the Han Solo. He doesn’t look or sound much like Harrison Ford, which is admittedly impossible. Fortunately, his acting didn’t pull me out of the movie quite so much as I’d feared because Ehrenreich’s Han undergoes a different type of character arc. By the time we meet Ford’s Han Solo in A New Hope, the character had reached the end of one character arc and is ready to begin the next. Over the course of the films, Ford’s Han grows from a cynic who distrusts everyone in A New Hope to a loving father who wants to believe the best of people in The Force Awakens. Han believes that his son Ben will not kill him, and then dies still loving his son despite the betrayal. By contrast, with Solo, we’re watching a “good guy” trying to become a cynical con artist. To be clear, Ehrenreich’s Han doesn’t believe in the Force and doesn’t believe in any higher causes, but he still believes in people. He trusts in the inherent goodness of people. He wants to be the jaded cynic, but he doesn’t understand how cynical the galaxy really is until the end of the movie. In some ways, this tension between Ehrenreich’s Han and Ford’s Han reflects the struggle for the soul of Han Solo that has been ongoing for decades. In the original version of Star Wars released in 1977 (not yet called A New Hope), Han comes across as a much darker character. Soon after Luke and Ben Kenobi hire him in the Mos Eisley Cantina, a bounty hunter named Greedo corners him demanding he repay Jabba the Hutt. Han shoots Greedo in cold blood and then calmly tosses some credits to the bartender, halfheartedly apologizing for the “mess.” There was no hint at this point in the story that Han was a smuggler with a heart of gold. In fact, the first time I saw the movie, I was convinced that Han would end up betraying Luke to the Empire (like DJ did in The Last Jedi). I was genuinely surprised when Han returned to help Luke destroy the Death Star. With the 1997 Special Edition of A New Hope, George Lucas made a change to the film that had a profound impact on Han Solo’s character arc. In the encounter with Greedo, Han no longer shoots first. Instead, Greedo tries to shoot Han, misses, and Han then returns fire. Lucas has justified this change as necessary to fit Han into a heroic archetype and prevent the character from coming across as a cold-blooded killer (after all, he marries Princess Leia). Yet, this also means that Han had a far shorter distance to travel for redemption. In some ways, Solo doubles-down on this retconned interpretation of Han. It does seem to strongly agree with Lucas that Han at his core was – and is – a good person (one character even calls him “the good guy”). Combined with the Special Edition, Solo strongly suggests that Han’s character arc in the Original Trilogy wasn’t about learning to trust others so much as rediscovering a truer, more trusting self that had been suppressed. At the end of Solo, Ehrenreich’s Han is still surprisingly noble, even going so far as to help a band of rebels rather than keeping the reward for himself. At the same time, Solo also suggests that Han can be driven to darker places under the right circumstances. Over the course of the film, Han slowly starts to realize that cynicism isn’t just an attitude; it’s a way of life. Han Solo is named Solo for a reason (and, yes, there is a cheesy scene that explains the origins of the name). In a rough and lawless galaxy, it’s hard for the “good guy” to form meaningful relationships. It’s telling that all of the other characters abandon Han, betray him, or die (all except Chewbacca, of course). There’s even a scene in which Han, anticipating betrayal, does shoot first. It’s easier to see why this smuggler with a heart of gold has such trust issues in A New Hope. Speaking of which, I was surprised at how much this is a film about Han Solo, as opposed to an ensemble film with Han Solo. 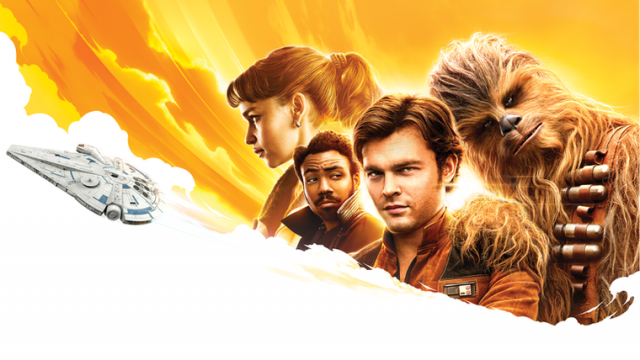 The marketing for the film promoted the wide cast of characters, including Tobias Beckett, Qi’ra (Emilia Clarke), Lando (Donald Glover), Val (Thandie Newton), Rio (Jon Favreau), L3-37 (Phoebe Waller-Bridge), and of course Chewbacca. Yet, for the most part, these secondary characters don’t have their own arcs. The movie is far more concerned with how Han reacts to the people around him than in telling their stories. While each makes an impression, most leave the story a bit too quickly. If you’re going into Solo expecting to see a lot of any of the secondary characters, you might leave disappointed. Having such a large cast of secondary characters does help with the world building. While Solo is Han Solo’s story, the galaxy moves on without him. Han frequently stumbles his way through a larger world rather than striding atop it. These secondary characters have lives that don’t revolve around Han. They have enough agency to leave when it suits their interests to do so. Other characters sometimes have stronger bonds with each other than with Han. For example, Beckett and Val have a romance that has no impact on Han himself. It’s refreshing to get a story in which the galaxy doesn’t revolve around the central character. It provides what Tolkien called the illusion of depth, the sense that any one of these characters could have a story just as interesting as Han’s (unlike The Last Jedi, where it sometimes seems like the only people who matter are the primary characters). In fact, if there’s a central theme to the movie, it’s that adversity reveals the true self. This resembles the theme of yet another Firefly episode, “War Stories.” In that episode, the villain quotes a Chinese philosopher who believes that you can only truly learn who someone is by putting them through torture. While nobody is literally tortured in Solo, the characters do suffer repeated setbacks with little hope of a happy ending. Beckett is the one who remains selfish. Lando doesn’t stand by his friends. Qi’ra puts power before love. L3-37 fights for her ideals to the end. Chewbacca rewards kindness with loyalty. And Han is the smuggler with a heart of gold who can shoot first when he has to. Given that fans saw Captain Malcolm Reynolds as essentially a take on the Han Solo archetype, it’s fitting that Solo seems to engage with the show’s themes. Given all of the trouble behind the scenes, including swapping directors midway through production, it’s perhaps a miracle that Solo: A Star Wars Story holds together as well as it does. It’s far from a perfect film and suffers a bit from a checklist approach to backstory (we see Han meet Chewie, the Kessel run, Han win the Falcon from Lando, etc. ), but it works as a fun adventure piece that takes place in the Star Wars galaxy. The film tells a much smaller story with much lower stakes than any previous entry into the Star Wars saga. It’s part character study, part western. While Han Solo doesn’t have to be your favorite character to enjoy this film, I suspect viewers who feel invested in the character will get the most out of it. Dom Nardi is a Contributing Writer at Legendarium Media. He has worked as a political scientist and as a consultant throughout Southeast Asia. In addition, he has published articles about politics in Star Wars and Lord of the Rings. You can find more of his writing on his blog NardiViews or follow him @NardiViews.